I am not typically a fan of diet books, especially ones that promise radical results in a short period of time. My philosophy is gradual, graceful lifestyle changes that bring health into harmony in a sustainable manner. Not a battle with a restrictive diet. 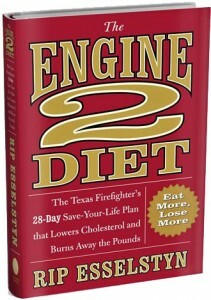 So when I saw the title of the book, The Engine 2 Diet: The Texas Firefighter’s 28-day Save-Your-Life Plan That Lowers Cholesterol and Burns Away the Pounds, I dismissed it as another get-thin-quick scheme. However, I knew the core of the E2 diet was eating meat and dairy-free and was curious what a Texas Firefighter (a description that invokes big portions of mostly meat to me) had to say about this meal plan that is gaining mainstream popularity. Bill Clinton has adopted a plant-based diet and Meatless Mondays are now offered at many schools and hospitals. But is this just a fad? There seems to be a paradox because at the same time it is predicted that world meat consumption will double by 2050 and between 1950 and 2007, per capita meat consumption in the U.S. increased by 78 pounds to a whopping 222 pounds per person per year. Then I saw an early screening of the movie Forks Over Knives, which features the book’s author, Rip Esselstyn. Something about the charming, fit firefighter and his enthusiasm for leading us all on a health make-over was all the more intriguing. The movie mostly features Rip’s father, Dr. Caldwell B. Esselstyn, a well-known doctor and researcher, and Dr. T. Colin Campbell, a researcher and co-author of The China Study. The film’s premise is that most, if not all, of the degenerative diseases that afflict us can be controlled, or even reversed, by rejecting the conventional menu of animal-based and processed foods. Esselstyn follows in his father’s footsteps by promoting a “plant strong” diet and undertakes his own experiments to develop his E2 diet and subsequently demonstrates its efficacy. The diet was started after a bet with his fellow firefighter as to who had the lowest cholesterol. When this good-natured competition revealed that one of their fellow firefighters had a cholesterol level over 300 (a suggested healthy cholesterol is under 200 with greater than 240 considered very high), Esselstyn and the Engine 2 crew were inspired to put a diet and exercise plan into action. Esselstyn wants you to try the diet for at least 28 days and claims it will be effective in lowering total cholesterol and LDL (the bad cholesterol) and in losing weight. You can do this by easing in and eliminating foods one week at a time (e.g., week one no dairy and no processed foods) for four weeks or go straight to the total E2 diet for all four weeks. On a very basic level the E2 diet is basically a vegan, low fat diet (similar to Dr. Dean Ornish) along with exercise. Since breaking down the four week diet portion of the book only takes four pages, the rest of book is filled basic nutrition knowledge (cholesterol, blood pressure, label reading, Body Mass Index, etc. ), disease descriptions, and medical research that supports his plan, some E2 exercises (lunges and side stretches), and a section on myths about food. The last third of the book is recipes, kitchen tips, and promoting weekly planning and all of it is peppered with personal antidotes and stories from disciples of the diet. I appreciated the plant-centric, low processed food message that Esselstyn promotes and I liked his layman, no fuss language, but sometimes his overly enthusiastic live-the-dream-with-this-diet tone irked me. As someone who works with patients and clients trying to make lifestyle changes, his all-or-nothing approach seemed hard to swallow, even for only 28 days. I think Dr. Ornish does it better when he offers a spectrum of choices; his latest book, the Spectrum, acknowledges that some shifting towards low fat, plant-based diet is better than nothing. It also bothered me that Esselstyn’s medical research, which was casually discussed in one chapter, wasn’t rigorously referenced. On a positive note, Esselstyn’s enthusiasm is probably more infectious to those who are not in the field. A reader will feel his love for food and health and his passion to spread his message. I suspect this book would appeal to men especially, with the firefighter angle, and does a good job of simplifying concepts such arterial plaque and insulin resistance. The recipes in the book looked quite good (especially the no-added-fat dressings and sauces) and I especially liked the E2 exercise section. The E2 exercise program could all be done at home or while traveling and had simple directions and photos making it all very do-able. All in all, the E2 Diet is a good book for the general public to learn about basic nutrition concepts, and wet their appetite for vegan, low processed food. For the main course I would be sure to read the books of Dr. Dean Ornish, Dr. Joel Fuhrman, Dr. T. Colin Campbill and Rip’s father Dr. Caldwell B. Esselstyn, all whom Rip Esselstyn thanks in his acknowledgements.